Dartmoor is a wild barren national park full of character that supports a very complex ecosystem. Its habitat is like most other moors but it has over 400 tors. The moorland is covered in heather and these outcrops of rocks, called tors, with rivers and streams that carve into the hilltops falling into valleys and boggy wetland. It can be a tough place to live, especially in the winter, but among the majestic landscape you will find ponies roaming the land. Most of the ponies you’ll see are Dartmoor ponies but there are also Shetland ponies among them. Dartmoor ponies can be black, brown, bay (a mixture of brown and black), chestnut, grey or roan (red, black, or brown with lightened extremities). They stand anything below 12.2 hands (124 cm) and pure breeds are stocky, have a medium length body with full flowing manes and tails. Dartmoor ponies can be very cheeky, stubborn ponies with a great character. They mainly eat grass but will also eat on moorland vegetation and bark and leaves if necessary. 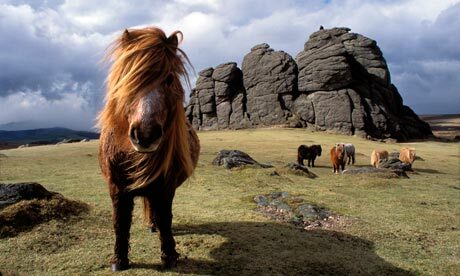 Most Dartmoor ponies living on the moor are not wild but are owned and graze on the moor. Most are bred on the moor with one stallion mating a whole herd of females. The stallion is called a ‘harem’; this stallion will defend and protect its herd of females and young from other males. Some breeders run their females on the moor with a gelding (a castrated male). The male will then stop any other males mating with its females. The male will also protect the females but if they mate their will be no offspring. This allows breeders to follow the bloodline of their mares and offspring. A lot of pure-bred Dartmoor ponies have a very well bred bloodline so breeders will do anything to protect it. Twice a year, all wild Dartmoor ponies are brought in from the moor in a drift. They are then sold on in sales. These ponies are bred wild on the moor and then sold on to private owners that break the ponies in and use them for riding or breeding. Dartmoor is a beautiful, calming place that is recommended by many as a must see. It is only a 45 minute drive from The Cottage Hotel, providing an alternative scenery to the beautiful coasts of Bigbury Bay, Hope Cove.